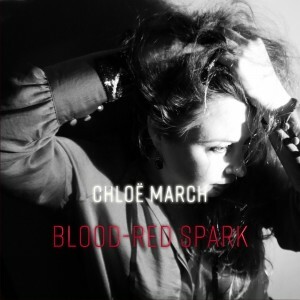 Chloe March “Blood-Red Spark” Out Now! We’re excited to anounce the release of the utterly sumptuous Blood-Red Spark, the new album by English dream-pop artist Chloë March. The album is available on CD and in digital formats via Bandcamp and also through all good 3rd party online stores. Be sure to check out the album trailer below! In her fourth album, Blood-Red Spark, March continues her exploration of a rich musical seam in which songwriterly storytelling and imagistic soundscape meet. Beautiful ambient/electro-pop soundworlds of warm spaciousness and radiant sensuality are underpinned by a compelling pulse – a vital heartbeat of an album of emotional concealments and revealments, truth and trickery, loss, longing and desire. March leads the listener through an immersive multi-layered world of melodic twists and unexpected harmonic shifts with the confident songcraft of a composer happily at home with her own distinctive musicality, occasionally reminiscent of Goldfrapp, C Duncan, The Cocteau Twins or David Sylvian, using her voice as intimate centre point and textural instrument. The single ‘Let It All In’ is at the heart of this intimacy, distilling the emotional magnetism that March brings to all her work into an intense shot of magic and liquid melancholy. Blood-Red Spark is further evidence of an artist gathering her musical forces and transforming them into shimmering gold. New Chloe March Single and Forthcoming Album! Gorgeous New Single from Chloe March!